U.S. gold climbed 1.7 percent Tuesday as investors returned to buying the metal at cheaper prices after gold dropped to a more than three-week low yesterday. Gold prices ended up $30.20 to $1,809.10 an ounce in the December futures contract on the Comex in New York. Gold traded from an intraday low of $1,772.00 to a high of $1,814.30. Gold prices fell 2.0 percent on Monday, which was the lowest level since August 25. "Basically a lot of the supportive factors for gold are still in place, so although we saw a bout of dollar strength (earlier) that took the whole commodities complex lower, things like Asian demand are very strong at this point," Reuters quoted Standard Chartered analyst Daniel Smith. "Gold is rallying … partly on the European situation, but also because there is this underlying uptrend in demand." Silver prices for December delivery rose 97.4 cents, or 2.5 percent, to settle at $40.137 an ounce, trading between $39.230 to $40.375. Silver plunged 4.1 percent in the previous session. Platinum prices for October delivery advanced $9.90, or 0.6 percent, to close at $1,781.90 an ounce. Platinum moved from $1,766.50 to $1,790.70. Palladium prices for December delivery rose $5.65, or 0.8 percent, to settle at $717.75 an ounce. The metal ranged between $715.00 and $724.00. London precious metals fixings moved mostly lower. 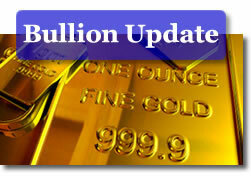 Gold was the exception, with its PM fixing prices on Tuesday up from Monday by $5.00 to $1,799.00 an ounce. Losses included silver at $39.18 an ounce, down $1.28; platinum at $1,774.00 an ounce, down $24.00; and palladium at $717.00 an ounce, down $4.00. *The Gettysburg and Glacier America the Beautiful Five Ounce Silver Bullion Coins are sold out. Unlike other investment-grade products, the United States Mint does not provide daily per coin sales totals for the Olympic, Vicksburg, and Chickasaw America the Beautiful Five Ounce Silver Bullion Coins. The individual totals are as of Monday, September 12. The overall total is as of Monday, September 19 (900 additional five-ounce bullion coins sold since last week).